of felt (different colors), I felt the 1 mm thick to achieve these wallets. for yarn of different colors. any beads, sequins, bells and company. 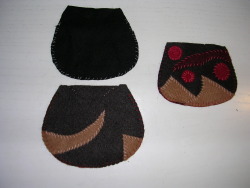 Decorate the three-piece sewing forms felt you cut carefully. It is possible to draw and cut its templates, to make a star for example. Points and vary the colors of your son to assemble pieces. 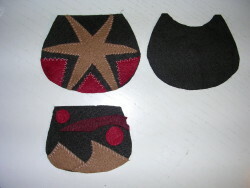 the lining of the flap: same shape and same size as the flap, one can reuse the same template. 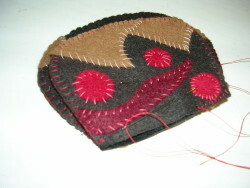 the inner two pieces of the same form as the back and front of the wallet, but smaller in order to then drag the liner in the purse. Resume templates back and front, remove approximately 2 mm rounded sides add 1 mm to the right side (to leave some room for assembly). 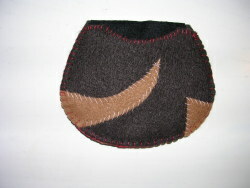 the flap and its lining. 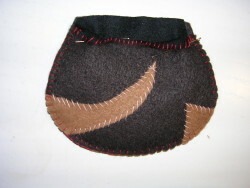 Insert the lining into the purse (inside dansl'extérieur), then sew the front of the liner with the front del'extérieur. Assemble the flap with the body of your wallet, secure with pins. 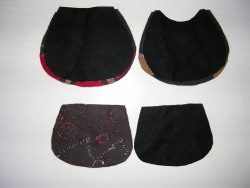 Sew the flap with the back (outer lining +). Be careful not to sew the front Duport with money! To avoid this unfortunate mistake, rabattreet pins set with the front (see picture, it is obvious to explain).